It has been a really warm summer, I am not complaining, I love it, but I just don’t want to put my oven on for a couple hours. That’s where my Crock Pot comes in to the story. I think it’s a magical thing indeed, just set it and forget it! Voila your family thinks you are a magician. 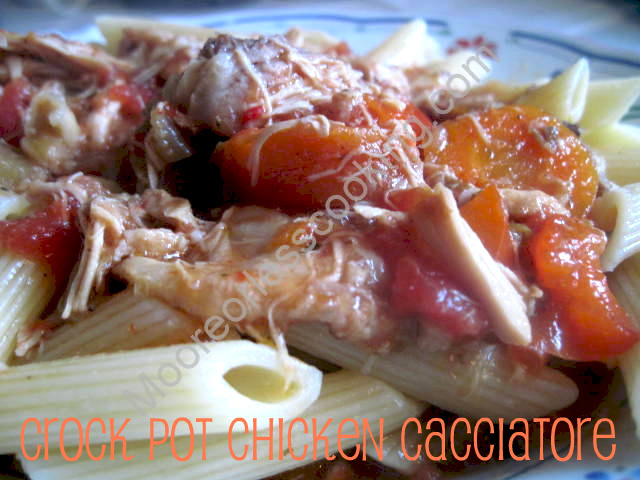 Chicken Cacciatore is a fabulous meal for a family or a crowd, I love to add lots of veggies and serve it over pasta or egg noodles, it’s even better the day after. All of the flavors have been co-mingling all night, wonderful! In a saute pan over medium high heat, add one tbsp olive oil, when oil is hot add chicken thighs and brown. Set aside. In the same pan saute onion, scrape off brown bits, add pepper, celery, mushrooms and carrots. Place veggies after sauteing for 5 minutes into crockpot, cover with tomatoes, cover with chicken, add Italian Seasoning. Cover Crock Pot, set on High for 4 hours or Low setting for 6 hours. Serve over pasta.